I started making mosaics a couple of years ago and now my tiny condo is filled with them. I have tried various types, from flower pots to trays to mirrors and finally to crash glass mosaics. 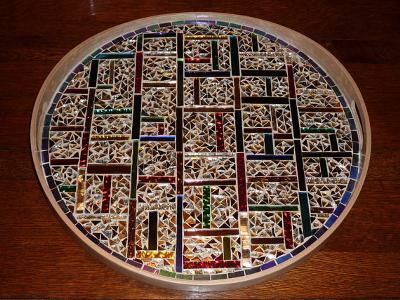 I spend most of my time when I am not working at my job, working on my mosaics. I bought the tray I used from Ikea and wanted a Mondrian style design. The colors of the strips were so beautiful, red, blue, green, purple, orange glittery stained glass I couldn't resist using them. I filled it in with gold, silver and copper tiles.It is one of my favorite pieces.